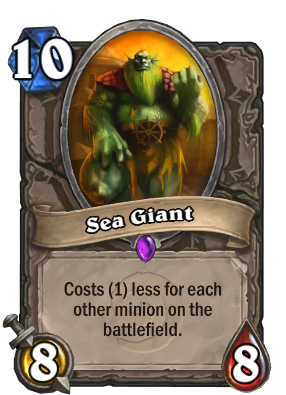 I wish these giants had Taunt or something useful in addition to their odd cost mechanics. As it stands, they always seem like too much of a liability to actually include in a deck. Can anyone offer a reason not to disenchant giants? i was replying to the comment on giving it taunt or something. I know, I was just adding my thoughts to the discussion and totally agree that the changes suggested by bpcookson are a bit overboard. I like that they don't have taunt. If they did TBK would kill them. Interestingly enough, if the giants did in fact have taunt, most decks who run Harrison Jones would also run The Black Knight. So it would be nice to have more variety in cards being run, but everything I said before is irrelevant because then it would be OP and it would just ruin the game. Given the changes we've seen since my original post during the first month after launch and considering the thoughtful discussion that resulted here, I'd say it's clear that charge should be a minimum addition. Something also like Windfury or even a separate mechanic to reward their use. For example, we should probably have a Gigantism mechanic whereby cards with Gigantism have all their effects doubled for each giant in play. Seriously though, it's kind of comical to see my comment now from nearly two years ago. And for those who might need or appreciate closure, yes, I have long since seen and understand the value of giants, as they are, in decks designed to use them. Cheers! P.S. Giants with Taunt tho!